HFP530A full automatic lightweight concrete wall panel system is Hongfa patent product, for 10 sets molding machine, total production line only needs 7 women, labor density and intensity is low. It adapts hydraulic de-molding system, it is fast and convenient, also suitable for pallet stacking. It can decrease broken rate efficiently. Fireproofing. It is A-class fireproof material, hence it has endured 1000 degrees centigrade high temperature, 120 minutes combustion test. Environmental friendly. In other words all materials of wall panel does not contain harmful and radioactive subatances to human body. Lightweight. Since EPS sandwich wall panel weight is the sixth of concrete block. Increase usable area. 75mm EPS wall panel can instead of 120mm traditional wall, and each 12m extender of the wall, usable area can be increased 1 ㎡. PLC control system, the mould opening and closing is hydraulic, hence it can be controlled automatic. 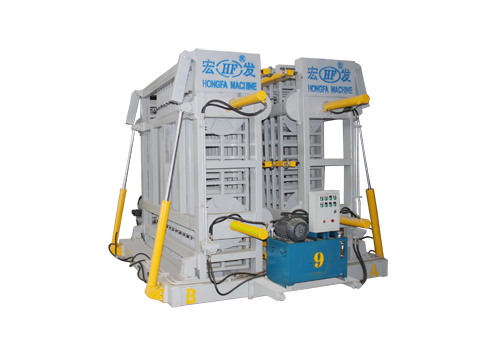 In addition, the wall panel machine can produce the lightweight panel length of 3M, width of 60cm, thickness of 60-200mm. Panel size also can be produced by customer requirement. Since electrical and steam-powered heating system. Therefore makes demoulding fast, short time conservation, and the cost is much less. Because forming mold chamber has high stiffness. So panel making has high precision, the thickness is prospective, and the surface of panel is smooth. Plastic core tube is lining metal tube, so it is durable, free washing, pulling tube by electric. Horizontal molding machine adopts hydraulic and combining mold, it guarantees products accurate size, hence this distinguishs it from traditional equipment.